Sooo…I cried while reading this book. That’s twice in one week now, and the week’s not even over with yet. Darn. 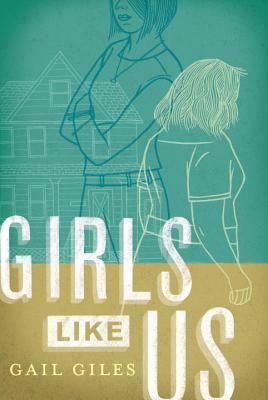 “Girls Like Us” is the story of Quincy and Biddy, two “Speddies” (their term for special education students) who graduate from high school at the same time and are placed in a living assignment together by a school caseworker. The girls live together in a small apartment above Miss Lizzy, a wealthy elderly woman, in exchange for cooking and cleaning and helping around the house with physical tasks. At the beginning of the story, Quincy and Biddy are not friends and are polar opposites. Biddy is white and, we learn, was born with her mental disability. Quincy, a mixed race girl, was ‘normal’ until around the age of 6 when she was physically assaulted by her mother’s boyfriend and brain damaged as a result. Biddy is shy and timid, and Quincy is outwardly aggressive and opinionated. Quincy is slightly higher functioning than Biddy and holds a job at a local grocery store, Biddy helps Miss Lizzy around the house. Eventually they settle into their lives together and uncover the pain of their pasts and work through the physical, emotional, and sexual abuse that they have endured. This book is presented in alternating chapters between the perspectives of Quincy and Biddy. One of the problems with this technique in other novels is that multiple voices sometimes have a tendency to get muddled and begin sounding the same–but fortunately, this problem never once happened in this book. Ms. Giles does an excellent job of maintaining a clear, distinctive voice for both characters. There were colorful spellings and pronunciations that were spot-on, it was evident that Ms. Giles knows this population (a blurb in the back of the book says that she taught special education students for 20 years) and is familiar with the inner thoughts of special needs people. Although this was a short book with simple narration, it is not an easy one to read. There were definite adult themes of physical and sexual violence. The characters’ stories were so heartbreaking that there were a couple of times that I had to close it and I almost didn’t finish. The author did a fantastic job of demonstrating the struggles of young people with disabilities. Powerful stuff.